I don't find wooden wall magazine racks very often at the local thrift shop. This one was probably from a waiting area in an office or clinic. I thought it had some possibilities so I picked it up. 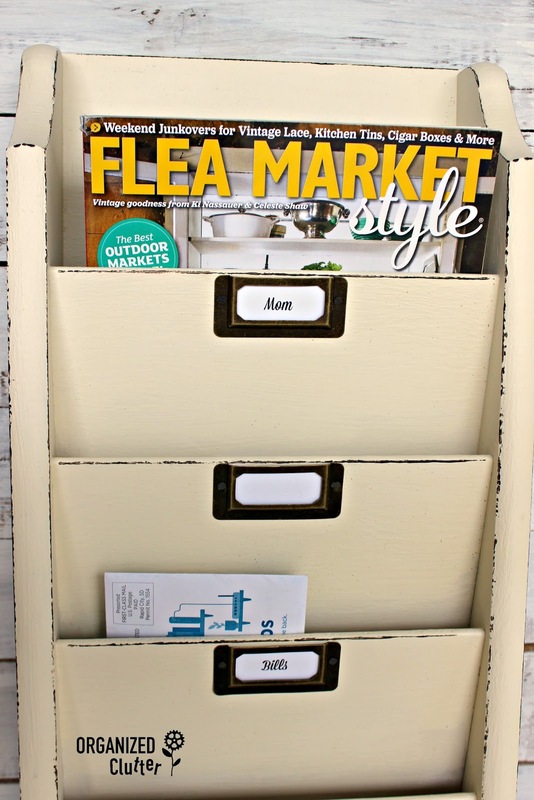 I started out planning to paint the magazine holder with my Dutch Boy Chalky Finish Paint in Antiquated Lace from Menards but changed course after a partial coat to Rustoleum Chalked in Chiffon Cream so I could spray paint into each cubby. In other words, it was harder to paint than I thought it would be. Rust-Oleum Chalked Paint in Chiffon Cream is available in both 30 oz. brush on cans and the spray can. After the Chiffon Cream, I used my FolkArt Home Decor Layering Wood Block to distress the edges of my project. I shared my Layering Block technique HERE. I sealed the organizer with Rust-Oleum Chalked Clear Sealer/Wax Spray . I added Spare Parts brand label tag holders from Hobby Lobby. I did not use the enclosed cardboard type metal holders, but instead used black carpet tack strip tacks to nail the label holders to the fairly thin panels. The carpet tack strip nails were a bit too long and I ended up snipping of the tip with a needle nose pliers and pre-drilling the nail holes. I think a craft store may have shorter screws in jewelry parts that would also work. I stenciled on a "doily" or Boho style design with a stencil brush, Walnut Noyer craft paint and a Show-Offs brand stencil from Hobby Lobby. I picked up the stencil for $2.99 at the store. I did not find the exact stencil on Hobby Lobby's website, but they have similar stencils. My daughter in law will get the organizer for her kitchen wall. 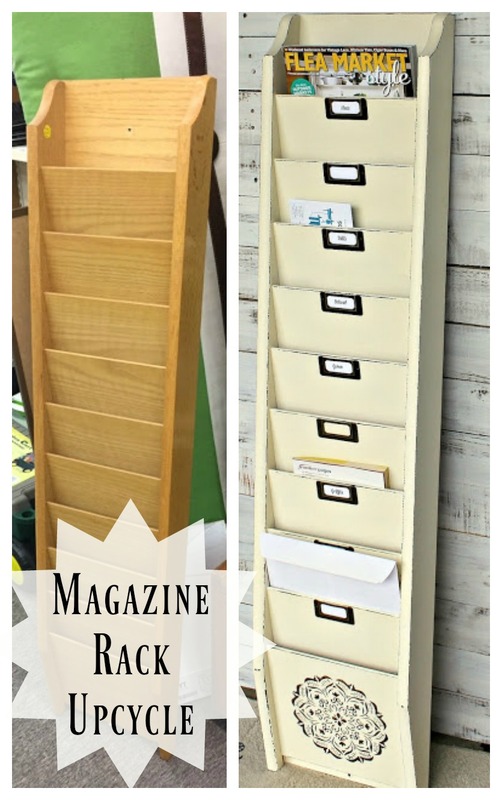 Lots of organization possibilities from a kind of unusual thrift shop find! That is impressive! 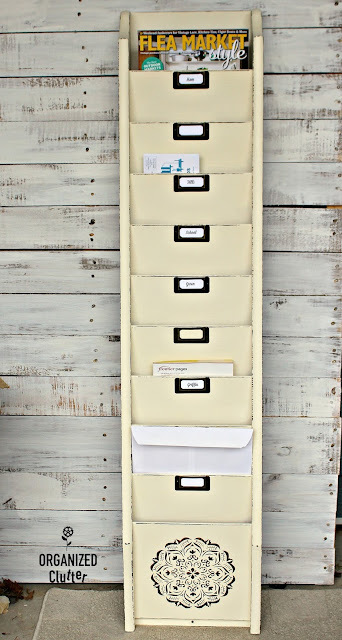 That would work to hold genealogy papers while researching - I always have such a mess. Great job. Love this piece. It would be so handy to have in many different rooms. It would certainly hold alot of items. This would come in handy-er than the napkin holder on the table for mail! 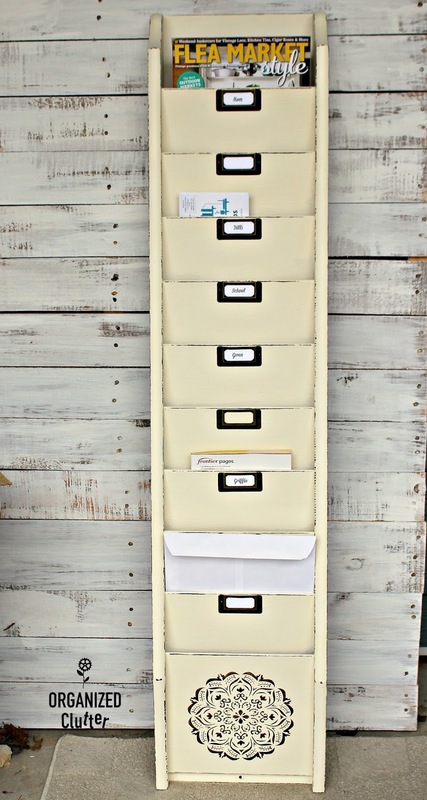 This would keep anyone organized! Mainly me. Great job, Carlene! Now I have to find me one. Your daughter in law is lucky to receive such a personalized and useful gift. Beautiful job! That is so unique, Carlene. And I love the make-over color you used. What a great organizing item. I think your daughter-in-law will be thrilled to have it! I just LOOOOVE your revamps! The card file design is so stylish! 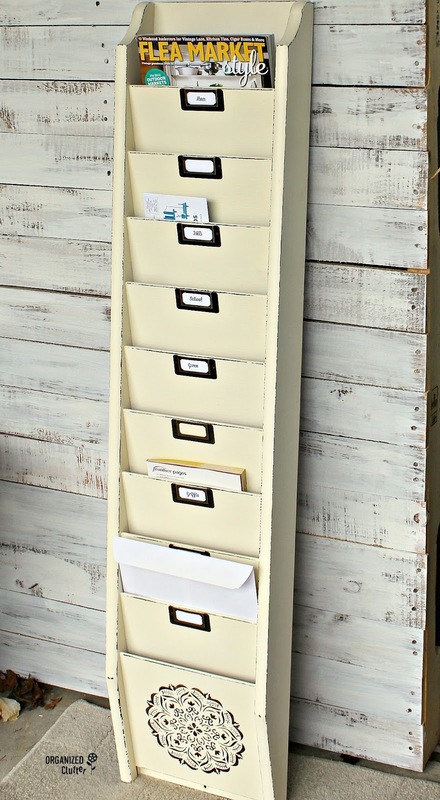 Such a gorgeous upcycle, love the addition of the label tag holders... perfection!